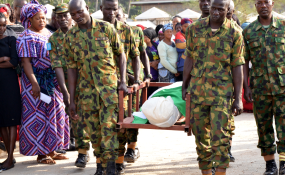 Soldiers carry the remains of a dead colleague during the burial of 14 Nigerian military personnel who lost their lives in an ambush by Boko Haram on Damaturu-Maiduguri Highway in Kaduna. A former Nigerian president, Olusegun Obasanjo, said on Sunday that the Boko Haram insurgents have become stronger than ever. Mr Obasanjo, a retired military general, made this known in a lengthy statement he issued on Sunday. In the statement, Mr Obasanjo accused President Muhammadu Buhari of not only failing in all aspects of governance but also plotting to rig the coming election. The former president said Mr Buhari's alleged desperation to remain in power despite his mental and physical incapacitation, reminds him of the era of a former military dictator, Sani Abacha. Calling on Nigerians to resist any plot to rig the election, the former president said the electorates should make good use of their permanent voters card to vote out the incumbent administration that has also failed to manage the country's security problem. According to Mr Obasanjo "the security situation has deteriorated with kidnapping everywhere and Boko Haram more in action and nobody should deceive Nigerians about this." Mr Obasanjo said if Nigerians fail to take a definitive step by voting Mr Buhari out of power in next month's general election, Boko Haram and its Islamic State's West Africa Province (ISWAP) may soon take over the entire West African region and make life unsafe for all. "With the teaming up of Boko Haram and Islamic State's West Africa Province (ISWAP), Boko Haram is stronger today militarily than they have ever been," said the former President. "Boko Haram has also been empowered by the Nigerian government through payment of ransom of millions of dollars which each administration disingenuously always denies. "With ISIS being liquidated in Iraq and Syria, Africa is now their port of concentration. Soon, they may take over Libya which, with substantial resources, is almost a totally failed state. When that happens, all African countries North of Congo River will be unsafe with serious security problems. "The struggle must be for all West African, Central African, North African and most East African States. Nigeria has to play a vanguard role in this struggle as we have much to lose. "This administration has reached the end of its wit even in handling all security issues, but particularly Boko Haram issue, partly due to misuse of security apparatus and poor equipment, deployment, coordination and cooperation. "Finally, those Nigerians that are being intimidated or threatened by this Administration must trust in God and stand firm. Tough times do not last forever, but tough people invariably survive tough times. This is a tough time for almost all Nigerians in different respects, but the people's will shall triumph. "All people who have registered to vote with their PVCs must never allow anybody or anything to deny or deprive them of the right of performing their fundamental civic duty of voting and sustaining democracy. "Establishment of democracy and its sustenance is second to attainment of independence in our political life, leaving out the victory of the civil war. We shall overcome." President Muhammadu Buhari who was brought to power through a popular vote promised to end the Boko Haram insurgency in six months. Though the administration has been able to reclaim some local government areas that were under the control of the insurgents, the group is still able to carry out attacks on military formations and civilians in the three North-eastern states of Adamawa, Borno and Yobe.